2015-16 Help Bangledesh is Drowning The objective of the project is to make the community within the village fully conscious about the CC and initiate efforts to address the issues with proper technologies and skill those are to be replicated to other areas. 2013-14 Czech it out In 2013, we celebrate the 200th anniversary of the birth of the Scottish missionary and explorer, David Livingstone. It therefore seemed appropriate that our appeal should centre on the famous Son of Blantyre. 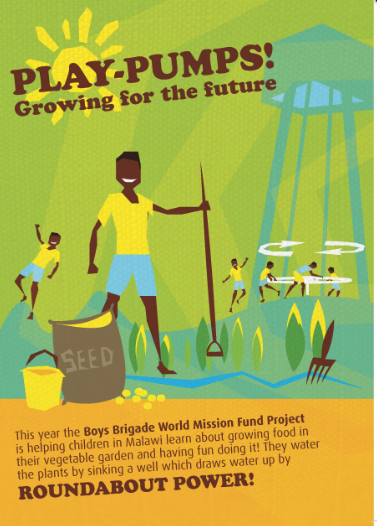 The project will help children in Malawi learn about growing food in their vegetable garden and having fun doing it! 2012-13 Play Pumups! Helping children in Malawi learn about growing food in their vegetable garden and having fun doing it! They water the plants by sinking a well which draws water up by ROUNDBOUT POWER! 2011-12 Marching to a new tune! 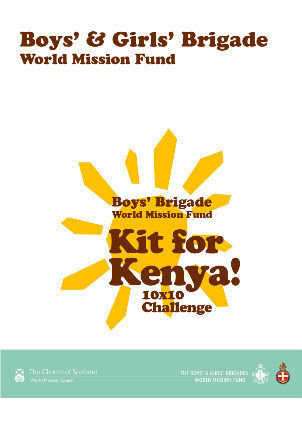 Used to raise funds for band equipment and uniforms for BB Companies in Zambia. 2010-11 : What a gas! To support green projects that improve the environment and the lives of poor people living in China. 2009-10 : The Real Transformers! Providing equipment to children and young people in Budapest, Hungary. 2008-09 : Get a Life! Providing skills training for children and young people in Malawi. 2007-08 : What a load of Rubbish! A project for the children Rag-Pickers of Bhandewari dumping ground, Nagpur, Northern India. 2006-07 : The PlayAway Appeal For blind and visually-impaired children at Al-Shurooq School in Palestine. 2005-06 : Skills Training in Bangladesh Helping to raise support for mobile training for young people in Bangladesh. 2003-05 : Good News to Share Providing Bibles to the Presbyterian Church in Nigeria to build up and support youth outreach. 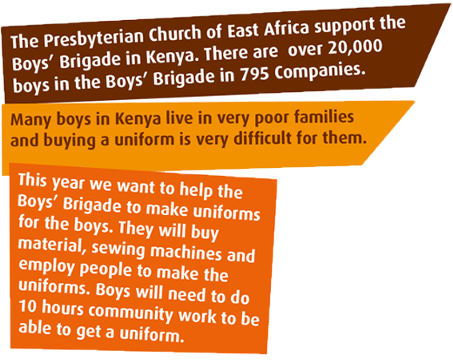 2001-03 : Building for Development Helping The Boys' Brigade of Ghana to fund the building of two Brick Making Plants. 2000-01 : Water for Life Funding a new water system for the Ekwendeni Mission Station in Malawi.